Helen Ltd, a major energy utility in Finland, is heading a research project that will explore innovations in using and controlling energy storage as part of the smart grid initiative. 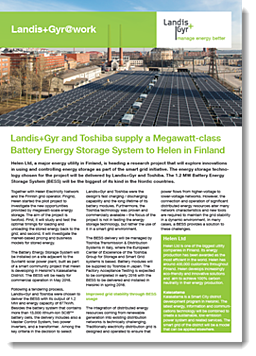 The energy storage technology chosen for the project will be delivered by Landis+Gyr and Toshiba. The 1.2 MW Battery Energy Storage System (BESS) will be the biggest of its kind in the Nordic countries.